Sometimes Bing Crosby gets to smoke his pipe, but most of the time, his pipe is safely kept in Special Collections in the Foley Center Library at Gonzaga University. Created by Spokane sculptor Deborah Copenhaver, a larger-than-life bronze statue of Bing Crosby has stood outside Gonzaga’s Crosby Student Center since May 3, 1981. It depicts Gonzaga’s and Spokane’s famous son in a typically relaxed posture – golf clubs present and, of course, smoking his ever-present pipe. Or, at least, that’s how it started out. 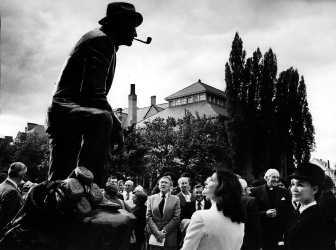 The first time the pipe was stolen was the very night the statue was unveiled, according to 1981 news accounts – thus beginning an ignoble tradition that continues to disappoint GU officials and fans alike. Stephanie Plowman, Special Collections librarian and Bing Crosby curator at GU, said that after many cycles of reattaching the pipe, followed in short order by pipe snatchings, the university had a screw-in pipe fashioned, which she keeps under lock and key. Bing goes without his signature pipe now unless there is a special campus event or other reason to take a chance and temporarily reattach the pipe. But, they watch carefully for the brief periods the pipe is back where it belongs, Plowman said. The statue is possibly the most visible memorial to Crosby in Spokane. The singer-movie star attended Gonzaga and received an honorary degree from the university in 1937. He had been quoted as saying he actually attended for 16 years – counting Webster Elementary School on the Gonzaga property (now the site of an apartment complex), two years at what was then Gonzaga High School, two years as an undergraduate and two years as a law student. Dedication of the statue four years after Crosby’s death (and on what would have been his 78th birthday) was a big event that drew many dignitaries and celebrities. A live phone call from Bob Hope, with whom Crosby collaborated on many of their famous “road” films, was heard over the public address system, and a letter from President Ronald Reagan was read. News media from around the world carried stories about the event. Interest in Bing Crosby hasn’t waned since. Plowman participated this summer in a BBC radio interview on campus for a six-part series on Crosby that will be broadcast in the United Kingdom – and last year, Spokane celebrated renaming the Met Theater the Bing Crosby Theater. The Crosby Room in GU’s Crosby Student Center houses the singer’s gold and platinum records along with his trophies – including the replica of the 1944 Oscar he received for his role in “Going My Way” (Crosby had the duplicate made for display at his alma mater). Plowman notes that there are some 2,500 visitors who sign the guest book every year, with representation from all 50 states and 23 foreign countries. Admission is free. However, the bulk of the Crosby collection is held in Special Collections and includes some 25,000 items – sheet music, papers from the Bing Crosby Historical Society and sound recordings. The statue, which cost $50,000, was financed in 1981 largely through the sale of 100 small replicas, with the first one given as a gift to Crosby’s widow, Kathryn. One of the replicas was on display in Special Collections, but it’s now back in the vault. Someone snapped the tiny pipe off the 14-inch tall, 15-pound statue when it was out in the open.